The Sunday following the AGM club members and friends were invited to Coldharbour Mill Working Wool Museum in Uffculme Devon. 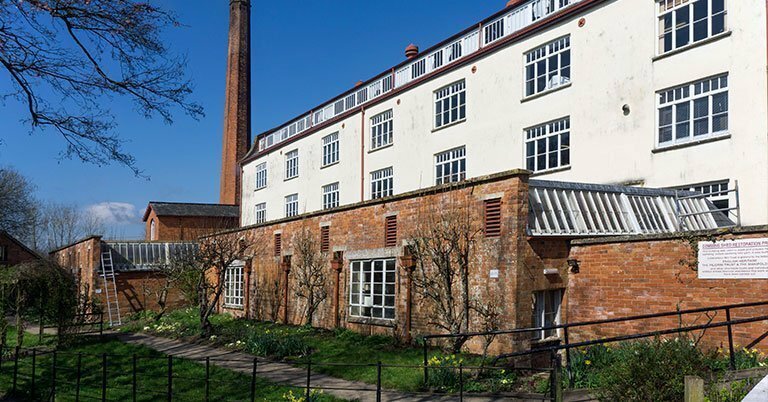 The mill is one of the oldest woollen textile mills in the world, having been in continuous production since 1797. Around 20 members, family and friends attended on what was a cold but dry morning. The mill staff made us very welcome and gave us a very informative and enjoyable tour of the mill. The mill is dual powered with a working water wheel and a number of steam engines all fed from a pair of Lancashire boilers. One was in steam as the mill had a Halloween special weekend, (a welcome warm up by the old boiler). The mill was running their impressive Pollit & Wigzell 300 hp, cross compound engine, driving shafting on all five floors of the mill via an operational rope drive system. The 1867 Kittoe and Brotherhood beam engine was gently running over and was able to be viewed from 2 floors. This engine was painstakingly restored and installed at the mill in the 1990’s in one of the disused beam engine sheds, along with a small generating engine chuffing away, providing 110v power to the lighting in the mill. On the working floors we had an insight into working conditions “back in the day” and demonstrations of combing, spinning, and weaving machines. Lots for our young members to enjoy, with pumpkin carving on the top floor, story time with the witch in the mill’s old air raid shelter and a well-equipped play area and to round off the day – a nice cuppa and cake in the waterside café.